Can Am Outlander 1000 Guide. Can Am Outlander 1000 Review. The Can Am Outlander 1000 model line is all new starting with the 2012 model year. A 1000 V twin Rotax engine sporting 82 horsepower gets all the headlines, but there are plenty of other features you'll want to know about too. There's a 1000 XT package with even more goodies that we'll also cover. Update! - Looks like the Outlander 1000 will come standard with the DPS power steering package for the 2013 models. Can Am Outlander 1000 - 82 horsepower of V-twin fun! Engine - Obviously, the big V-twin engine with liquid cooling and fuel injection is the headline news. A claimed 82 horsepower is serious punch, even in a quad that weighs in at nearly 900 pounds ready to ride. Maybe too much power in some situations, but we'll get to that a little later. As far as the engine goes, it's basically the same unit that powers the Can Am Commander 1000 side by side UTV. Like most Rotax engines, it starts easily, runs smoothly, makes good power for it's displacement, and will more than likely have good reliability. Can Am does offer an optional ignition key that reduces the available power, but if you think you need that, then what's the point of owning a machine like this? Why spend the extra money for a Can Am Outlander 1000, the most powerful ATV in the class, only to turn around and kill the very reason for this ATV to exist? 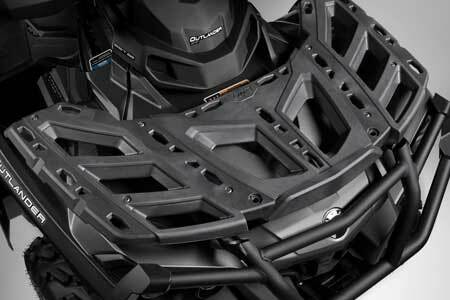 Frame - The biggest Can Am ATVs also get a brand new frame. We would call it more evolutionary since it's still the normal Can Am single spar type frame. This one has been streamlined for easier maintenance and strengthened for improved durability. Suspension mounting points have also changed in an effort to improve handling. 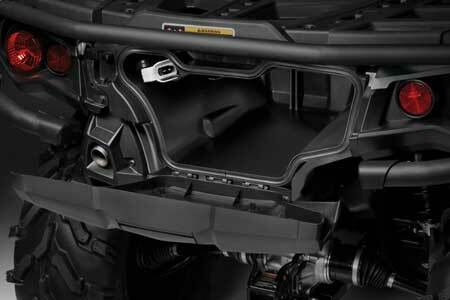 The new frame allowed the Can Am Outlander 1000 models to move the air box higher for better breathing, better resistance to water entering, and much improved accessibility. It also made it possible to move the battery, starter solenoid, rear brake master cylinder, and major relays underneath the seat. That helps to make regular maintenance more of a pleasure than a pain. And finally, the Outlanders come standard with a full skid plate! This is something almost every Can Am ATV owner has had to add in the past. Now, it's already there and this looks to be a good one. Coverage looks good and the material used is the latest high density plastic composite that's both light and tough. 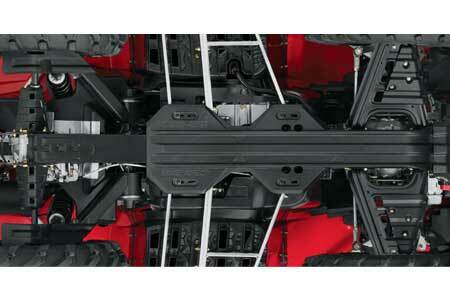 Full length skid plate is now standard on the Can Am Outlander. Suspension - At the front, double A-arms feature revised geometry to reduce dive under braking and less kick back through the steering. The rear has the now standard Can Am trailing arm type independent single control arms. Travel is 9 inches at the front and 9.3 at the rear. The only adjustment is spring preload. Brakes - This new Can Am Outlander 1000 uses a three rotor brake system with conventional outboard discs at the front wheels and one rear disc at the right rear. All three calipers are twin piston and all the rotors are 214 mm. That means the same pads should fit at either of the front wheels along with the rear. Interchangeability is good! Rack System - The new composite racks have kind of a space alien "spiny" look. Probably due to all the cutouts and elevated anti-skid ridges that are there to provide more secure mounting and more options for tie down locations. New composite front rack with lots of tie down points. You'll also see the geometric holes provided for the new Can Am proprietary "LinQ" accessory system. It looks like Can Am borrowed a page out of the Polaris playbook, since this system is very similar. The various accessories for this system can be had through your friendly local Can Am dealer. Total capacity is 100 pounds on the front and 200 pounds on the rear. Other Features - This is the catch-all place for the features we think you would like to know about, but didn't fit any of the other categories. So here they are. Standard 2 inch receiver hitch to go with the 1300 pound towing capacity. A 5.7 gallon water resistant rear storage box under the rear rack. Carlisle Badlands tires on cast aluminum wheels. Variable locking front differential - just put it in 4wd and go - nothing else to worry about. Larger 5.4 gallon fuel tank. And yes, you'll need it! Dual head lights and tail lights if you want to go crazy in the dark. A single multi-function digital gauge that tells you everything (after you read the manual and understand how to use it). Rear storage box on the Can Am Outlander 1000 is water resistant. So that's about it for the new base model Can Am Outlander 1000. Next up is the one with the XT package. You can check out the video first if you like. The XT package is a bundle of popular options for $1,500 more than the base Outlander 1000. We think that at least two of the options, power steering and a 3,000 pound Warn winch, are necessities and alone would cost more than the asking price. All the other stuff included in the package is just gravy. But we'll go through the whole list anyway. Electric power steering - This looks to be the most sophisticated power steering unit offered on any ATV or UTV at this point in time. It offers three different modes of assist - low - medium - and high. In addition, the amount of assist is variable according to speed. Less assist at higher speeds and more at low speed. 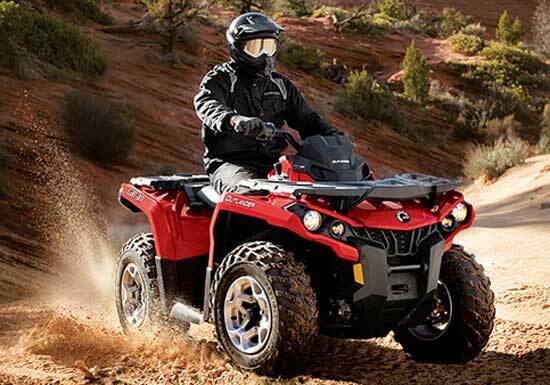 The Can Am Outlander 1000 is one ATV that really needs power steering. There might be a few riders in certain circumstances that could get by without it, like those who ride wide open spaces on relatively smooth terrain. But for the majority of the rest of us, this 4 wheeler just has too much power and weight to keep under control without a little help from power steering. Warn winch - Let's face it, unless you're on Olympic class power weight lifter, you ain't budging this 900 pound behemoth if it gets stuck. That's why you will need this 3,000 pound winch. Can Am even includes a nice remote control that has it's own place in the front storage compartment. Wheel and tire upgrade - The XT package includes cast aluminum wheels wrapped with Carlisle ACT radial tires. The wheels are painted black inside so we don't know how well that will hold up, but the radial tires are actually pretty good for OEM tires. Like we said, the power steering and winch cover the cost of the XT package, so the wheels and tires are almost a freebie. Heavy duty front and rear bumpers - These are actually genuine heavy duty bumpers. Made from substantial looking steel tubing, we've seen these take a beating and still look like they were ready for more. They're even covered by the factory warranty, so Can Am must have some confidence in them. Handlebar wind deflectors - Full width hand guard/wind deflectors. These things help more than you think when that wind chill starts dropping or when you're bashing through thick undergrowth and those vines and such keep grabbing at you. They might even help a little bit if you decide to try to knock down an oak tree. 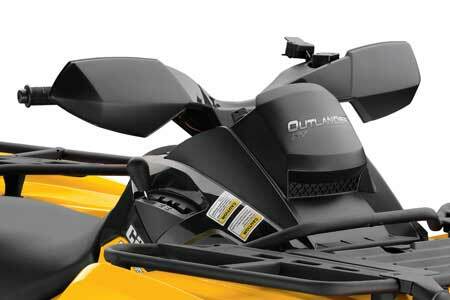 Full width hand guards come with the Outlander 1000 XT. Other upgrades - The XT also gets an extra capacity 650 watt magneto for extra power to run more lights or other accessories. There's also a tweak to the variable locking front differential to give it slightly quicker engagement than the standard Can Am Outlander 1000. 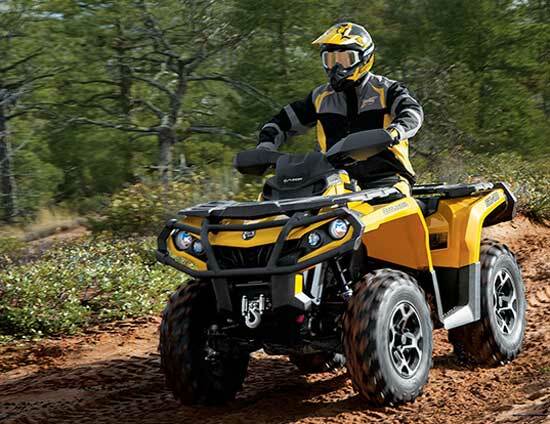 Specifications for Can Am Outlander 1000 and 1000 XT. Even though the biggest Outlander comes from Canada, it has an all American bigger is better attitude. Big money, big power, and big weight. This is a serious machine in every sense of the word. And as such, it's not for everybody. Let's face it, nobody needs this much power, but it sure is fun to have it. Interestingly, it's not as hard to control as you would think - if you don't get too carried away. It no doubt demands respect, but riding tight trails was plenty manageable. When you do hit the open spaces, this thing generates speed at an alarming rate. Made even more alarming by the soft front suspension giving up long before the engine. Be sure to adjust the spring pre-load before you try any top speed runs. Considering the weight, handling is pretty good at most sane speeds. The electric power steering really helps, and we're absolutely sold on it for an ATV this size. An added benefit is the ability to operate in 4 wheel drive without feeling like you're wrestling a grizzly bear. So who is the Can Am Outlander 1000 for? The person who wants the ultimate sport/utility ATV and is willing to pay for it. The size and power give the Outlander the ability to laugh at most work chores. It's more than competent for tight trail riding, and only a Colorado mountain goat could climb a hill as well. Tires are the only limiting factor in just about any kind of mud you'll encounter. It's as comfortable as any ATV out there for an all day ride. Problems? Our main complaint involves the brakes. Can Am really needs to add a hand lever on the throttle side like the Renegade. The other issue is overall braking power. This Outlander needs some more! Reliability wise, we heard about some early problems with the power steering, but those seem to have been ironed out now. CV boots are more prone to damage at the rear because the unique rear suspension leaves them more exposed. With the power of the Can Am Outlander 1000, CVT belts can get smoked if you find yourself in high range when you should be in low. But if you're the guy that wants to know he has the ultimate ATV in the garage, this Outlander 1000 deserves to be on that short list.